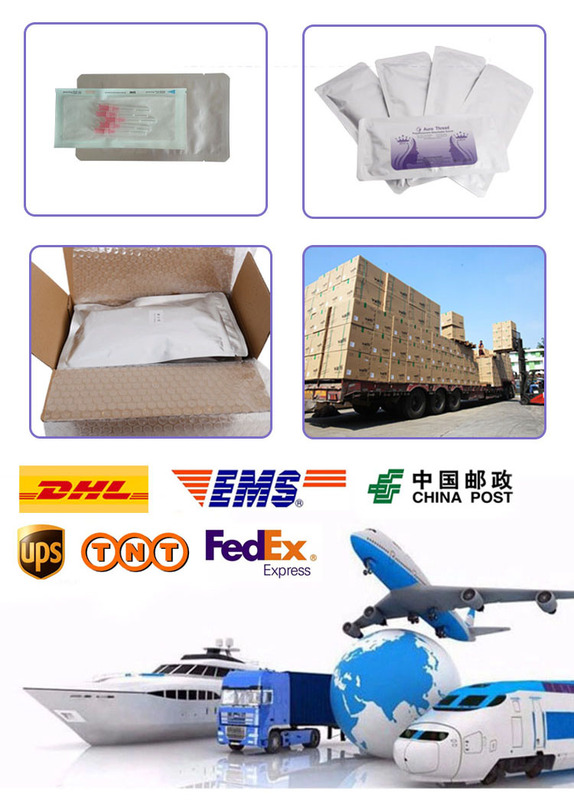 How long do the Lift Face Pdo Thread last? The threads are then naturally absorbed by the body in six to eight months, however, the effect of the treatment can last for up to two years as the body starts to produce new bundles of collagen around each thread and this, in turn, creates a lift effect. The results differ for each person but are very natural giving a rejuvenated and refreshed look. There is no scarring and recovery times are a lot less than those associated with traditional surgery. Eye Thread Mono are used to treat fine lines around the eyes, while Cog collagen thread are inserted deeper (into the SMAS layer) which creates a stronger lifting effect. Gold Thread Face Lift trigger the skins rejuvenation process producing new collagen, which helps to lift and tighten the skin, smooth the wrinkles, shrink the pores and enhance the volume, giving a more youthful appearance to your skin. Skin tightening PDO Thread are dissolved slowly and predictably, and are completely absorbed within 180- 240 days. 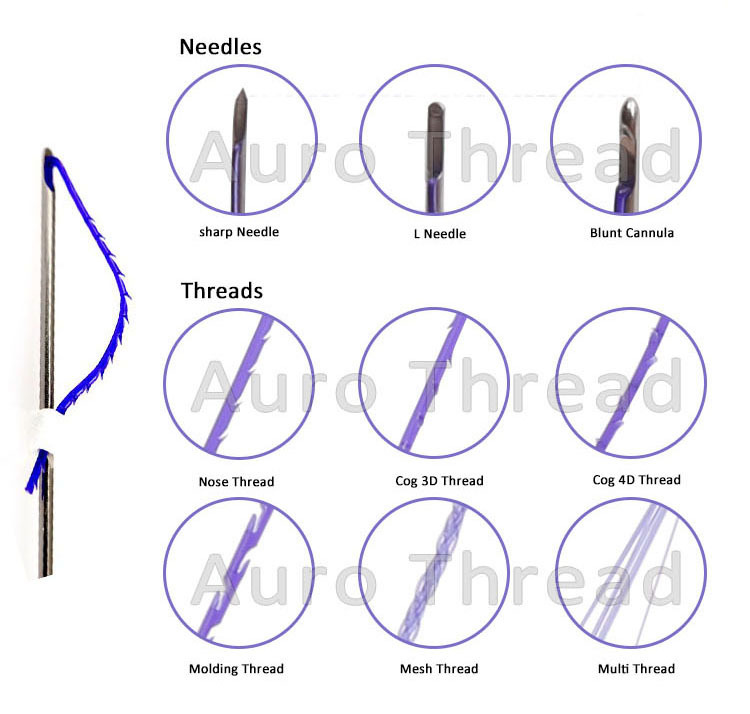 The insertion of lift cog Pdo Thread is minimally invasive and almost painless.Auro Thread lifting offers easy and safe way for bringing the youth and beauty back. The great thing about a PDO thread lifting is that it offers quick recovery together with excellent results. This procedure requires a minimum amount of non-invasive surgery and leaves no scarring. Local anaesthetic is all that is needed and there is no hospital stay either. Another good factor about the Skin Threading Face Lift is that it is much more affordable than a regular Thread Face Lift, and the results are long lasting. 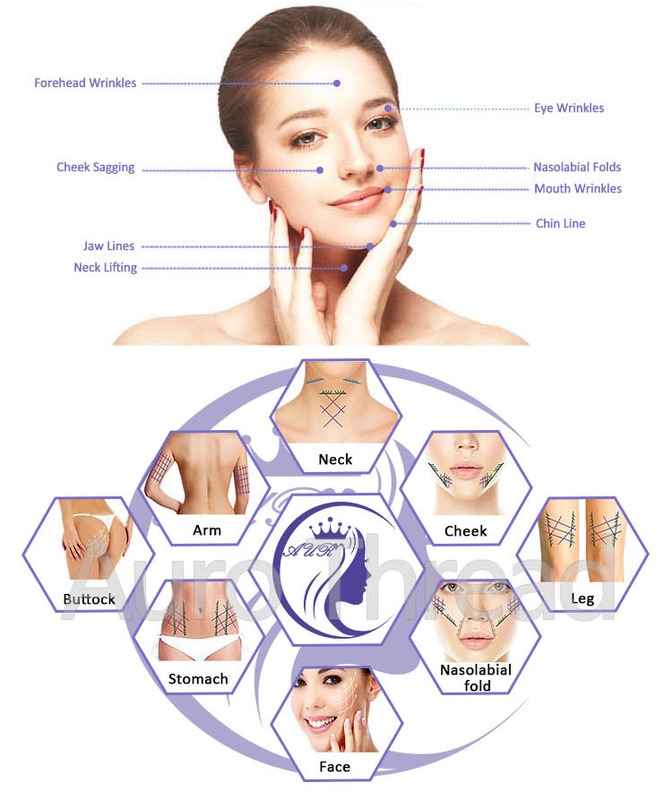 For Facial Wrinkles : By the strong PDO thread lift effect , skin regeneration and termination of line adhension , it is very effective to resolve deep wrinkle, wrinkles, forehead wrinkles, crow's feet. 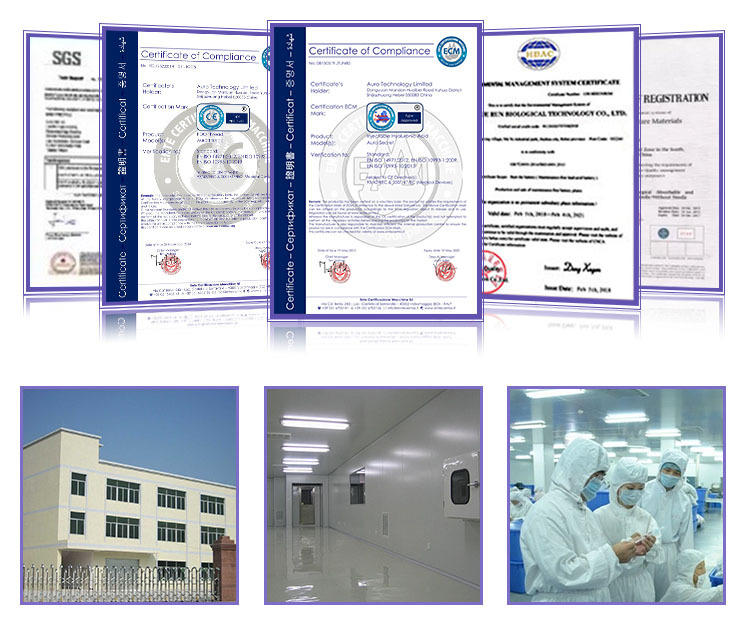 Looking for ideal Cog Collagen Thread Manufacturer & supplier ? We have a wide selection at great prices to help you get creative. All the Lift Face Pdo Thread are quality guaranteed. We are China Origin Factory of Lift Cog Pdo Thread. If you have any question, please feel free to contact us.